Description This Perry, Georgia hotel has an indoor pool, free internet access and non-smoking guest rooms. A free breakfast an indoor pool and rooms with microwaves and mini-fridges make the Comfort Inn & Suites Perry a hub of hospitality for our guests passing through the heart of Georgia. The two-story property has 90 rooms with microwaves mini-fridges and coffeemakers. Non-smoking rooms may be requested. Stay connected with available Wi-Fi. Start your day with hot waffles at the free breakfast. Year-round relaxation awaits in the indoor pool and hot tub. The on-site fitness room keeps guests in top form. Copy and fax services are available. The hotel just off I-75 is less than a mile from the Georgia National Fairgrounds. Several restaurants are within a half-mile of the hotel. Fort Valley State University is 10 miles from the hotel. Robins Air Force Base and the high-flying Museum of Aviation are 22 miles away. The hotel is 21 miles from Middle Georgia Regional Airport. 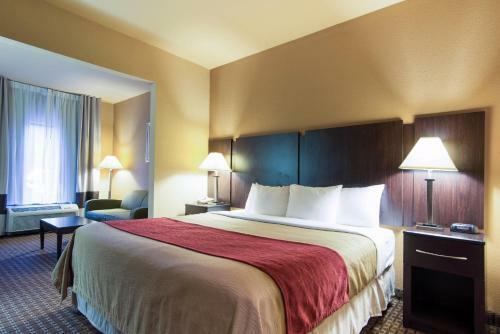 Add Comfort Inn & Suites Perry to your free online travel itinerary.